The Gallery app on the Liquid Jade S is a pretty standard affair, being the stock Android one, before the arrival of Photos. It defaults to an Album view with the Camera album on top laid out across the entire width of the screen. The rest of the albums follow with smaller thumbnails taking up half the display width. That arrangement cannot be changed with a pinch gesture or the like. You can however group the images by the time created, which takes the Liquid Jade S a few seconds to sort and display. Alternatively, the gallery can display your images according to location, if you remembered to tick the geotagging box when shooting them in the first place. Not much else can be said, except that you get a camera shortcut for direct access from the gallery. Single image viewer offers a two-stage dropdown menu with sharing options, as well as a shortcut to the most recently used one. Quick editing like cropping and rotation can be done from the option button up top, while for complex tasks there's a more capable editor. The editor is accessed from a small pencil icon from the bottom left hand-side corner. Multiple editing options are possible on the go including light adjustments (so you can bring out the shadows or the highlights), effects, color styles, straightening a photo, sharpening, saturation and what not. Most of these options have a slider that lets you fine-tune the strength of the effect. There is no dedicated video player app on the Liquid Jade S, instead videos are played from within the gallery. It has a pretty basic interface and doesn't pack much functionality, other than a Loop mode for unlimited repeat playback and a trim feature which lets you extract a portion of the video you're playing and save it as a separate file. Being a part of the gallery, the video player offers identical sharing options. The Liquid Jade S comes with adequate codec support. It played DivX and XviD videos without a hitch, but entirely refused to play WMV files. It did however manage to play MOV videos, not too common nowadays. AC3/AAC audio was also out of the question, but we're pretty much used to that. The lack of any subtitle support whatsoever may put off international users, but third-party apps can quickly solve that. For listening to music, the Liquid Jade S relies on Google's Play Music app, sporting the familiar Material design. It greets you with a "Listen now" screen which shows your recent activity. A swipe-in from the left opens up a menu where you can access your library, playlists, settings and the Instant mix feature. When fiddling with the phone, the app remains active in the background with controls, accessible from the notification shade. If you lock the phone altogether, a small control bar shows up on the lockscreen. A very nice FM radio app is available on the Liquid Jade S. In our case it managed to find a total of 37 stations and store them in its memory. It has RDS and can retrieve the stations' names, but interestingly enough, only displays them when the current station is playing. If you want the names to appear in the list of stations, you need to input them manually. You can also record audio straight from the radio app. 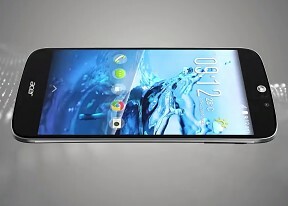 The Acer Liquid Jade S audio quality hardly impresses. The mid-range smartphone has below average loudness both with and without a pair of headphones and its clarity leaves a lot to be desired. When plugged into an active external amplifier the Jade S had very good noise level and dynamic range readings as well as no distortion to its output. 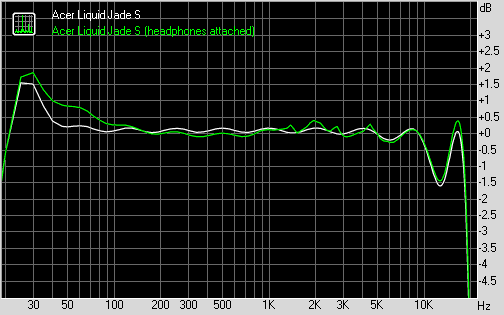 The stereo crosstalk is not exactly ideal though and neither is the frequency response. And here go the results so you can see the details for yourselves.